Ol’ Bones boldly went where many men have gone before. Over the rainbow, if you will. If he wasn’t a Judy Garland fan, well, I just can’t explain it. 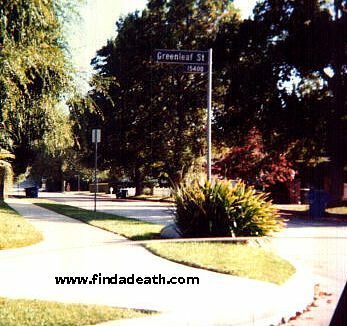 I owe a debt of gratitude to Findadeath.com friend Benny, who got the shots of Kelley’s house, in Sherman Oaks. Thanks Benny. 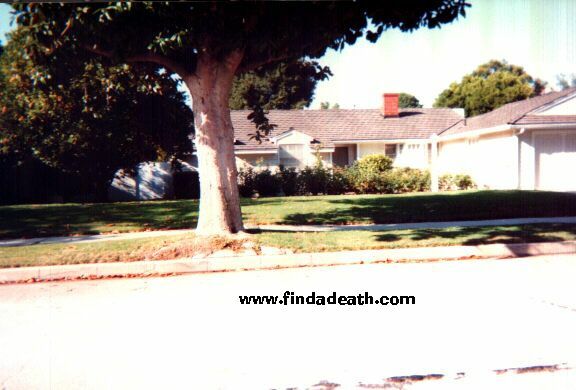 DeForest lived with his wife of 55 years, Carolyn, in Sherman Oaks, on Greenleaf Street. Their house was number 15463. DeForest had been suffering from stomach cancer for 18 months, and in February of 1999, his cancer entered the terminal stage. 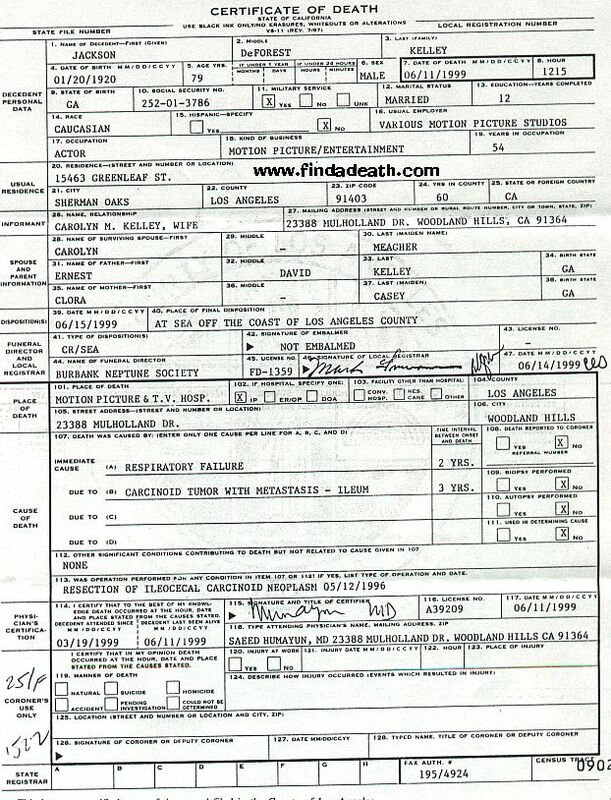 He moved in to the Motion Picture Country Home, in Woodland Hills. I am so angry with myself for not knowing this. I was in the Country Home in April, to meet Stanley Kramer, the producer of It’s a Mad Mad Mad Mad World, andMabel King thingy from What’s Happening!! (Oh God, you really don’t want to know. ), and I didn’t even know Kelley was there! Very pissed at myself. So, DeForest was in the home, and so was his wife, who was nursing a broken leg. He died at 12:15, on June 11th, 1999. His body was cremated on the 15th, and at some point and time, was going to be scattered at sea. On Tuesday June 22nd, there was a memorial service, held at Paramount Studios, in Hollywood. No doubt that loser A.C. Lyles was there. The only time he ever works anymore, is a good funeral. You know, you would think with all the Star Trek websites and fans, someone would post information about his memorial service. I have no idea which family, friends or celebrities attended this event, because most of the fan sites are self obsessed. Not like mine. (I’m grinning.) I have a lot of respect for fans and fan clubs. Honest, I do! But hearing the words of the fan club president, rather than words from real people who knew the dead guy, is a tad daunting. I’m being polite. Of course, I would have just pilfered the information anyway, so it probably serves me right. 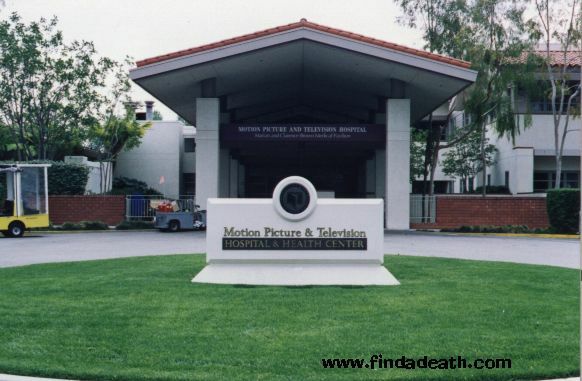 Update: Sept 1999 – Thanks to the brand spankin’ new friend of Find a Death (another mysterious soul…) for the following information regarding the memorial service. A.C. Lyles – a nobody dinosaur at Paramount – spoke at the memorial service. He opened the service with a story that DeForest had been in a coma for a few days, and when he came out of it, DeForest told him that he dreamt he was in heaven with Gene Roddenberry (right…) and Gene had written a Shakespeare play for DeForest to star in. That’s how it began. Everyone from the Star Trek cast was in attendance, except for Shatner and Doohan (Scotty). DeForest’s wife could not attend, because of her broken leg, so the videotaped the service for her. Then the cast proceeded to get up and wave to the camera when they were introduced. Patrick Stewart also attended. They showed a short reel of DeForest’s acting (mostly old westerns) and a few clips from Star Trek. To top it all off, cookies and sandwiches and water (nummy) were available after the service. Thanks for the scoop, Ms. Mystery. 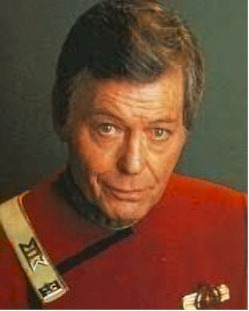 Trivia: DeForest is actually his middle name. He was born Jackson Kelley, in Atlanta Georgia. That’s all you need to know about his life, okay?